The identity of the Sony hackers is still unknown. President Obama, in a December 19 press conference, announced: "We can confirm that North Korea engaged in this attack." He then vowed: "We will respond. ... We cannot have a society in which some dictator some place can start imposing censorship here in the United States." The U.S. Government's campaign to blame North Korea actually began two days earlier, when The New York Times -- as usual -- corruptly granted anonymity to "senior administration officials" to disseminate their inflammatory claims with no accountability. These hidden "American officials" used the Paper of Record to announce that they "have concluded that North Korea was 'centrally involved' in the hacking of Sony Pictures computers." With virtually no skepticism about the official accusation, reporters David Sanger and Nicole Perlroth deemed the incident a "cyberterrorism attack" and devoted the bulk of the article to examining the retaliatory actions the government could take against the North Koreans. Other than noting in passing, deep down in the story, that North Korea denied responsibility, not a shred of skepticism was included by Post reporters Drew Harwell and Ellen Nakashima. Like the NYT, the Post devoted most of its discussion to the "retaliation" available to the U.S. The NYT and Post engaged in this stenography in the face of numerous security experts loudly noting how sparse and unconvincing was the available evidence against North Korea. 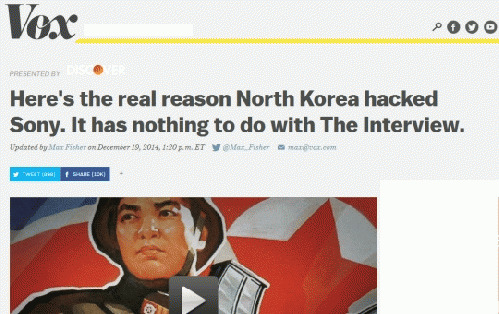 Kim Zetter in Wired -- literally moments before the NYT laundered the accusation via anonymous officials -- proclaimed the evidence of North Korea's involvement "flimsy." About the U.S. government's accusation in the NYT, she wisely wrote: "they have provided no evidence to support this and without knowing even what agency the officials belong to, it's difficult to know what to make of the claim. And we should point out that intelligence agencies and government officials have jumped to hasty conclusions or misled the public in the past because it was politically expedient." Numerous cyber experts subsequently echoed the same sentiments. Bruce Schneier wrote: "I am deeply skeptical of the FBI's announcement on Friday that North Korea was behind last month's Sony hack. The agency's evidence is tenuous, and I have a hard time believing it." The day before Obama's press conference, long-time expert Marc Rogers detailed his reasons for viewing the North Korea theory as "unlikely"; after Obama's definitive accusation, he comprehensively reviewed the disclosed evidence and was even more assertive: "there is NOTHING here that directly implicates the North Koreans" (emphasis in original) and "the evidence is flimsy and speculative at best." Yet none of this expert skepticism made its way into countless media accounts of the Sony hack. Time and again, many journalists mindlessly regurgitated the U.S. Government's accusation against North Korea without a shred of doubt, blindly assuming it to be true, and then discussing, often demanding, strong retaliation. Coverage of the episode was largely driven by the long-standing, central tenet of the establishment U.S. media: government assertions are to be treated as Truth. The day after Obama's press conference, CNN's Fredricka Whitfeld discussed Sony's decision not to show The Interview and wondered: "how does this empower or further embolden North Korea that, OK, this hacking thing works. Maybe there's something else up the sleeves of the North Korean government." In response, her "expert" guest, the genuinely crazed and discredited Gordon Chang, demanded: "President Obama wisely talks about proportional response, but what we need is an effective response, because what North Korea did in this particular case really goes to the core of American democracy." Even worse was an indescribably slavish report on the day of Obama's press conference from CNN's Chief National Security Correspondent Jim Sciutto. One has to watch the segment to appreciate the full scope of its mindlessness. He not only assumed the accusations true but purported to detail -- complete with technical-looking maps and other graphics -- how "the rogue nation" sent "investigators on a worldwide chase," but "still, the NSA and FBI were able to track the attack back to North Korea and its government." He explained: "Now that the country behind those damaging keystrokes has been identified, the administration is looking at how to respond."